TEUFELBERGER is one of the world's biggest producers of narrow polypropylene strapping. 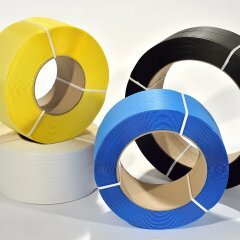 Its comprehensive product portfolio includes PP strapping that is 4-6 mm (1/6” – 1/4") wide. Thanks to its consistent high quality, TEWE® S-Band is ideal for fully automatic applications in the printing, corrugated board, and logistic industries. Its perfect running characteristics ensure a high degree of availability in the strapping process. * other strapping criteria on request.